The death of Dave Goldberg, the tech executive husband of Facebook's Sheryl Sandberg, could shine a light on treadmill safety. File photo: Man running on treadmill. Each day, runners in gyms and homes across the country turn to the treadmill to improve their physical fitness. But even the most well-intentioned workouts on the popular machines can have serious, and sometimes deadly, results. The U.S. Consumer Product Safety Commission estimates that 24,400 injuries associated with treadmills were treated in emergency rooms in 2014. And at least 30 people were killed in accidents related to treadmills in the 10-year period that spanned 2003-2012, the CPSC reported, an average of three treadmill deaths per year. The potential dangers returned to the spotlight this month, with news that tech executive David Goldberg, husband to Facebook executive Sheryl Sandberg, was found dead from severe head trauma next to a treadmill while vacationing in Mexico. A Mexican official told The Associated Press that the Survey Monkey CEO apparently slipped on the machine and fell. 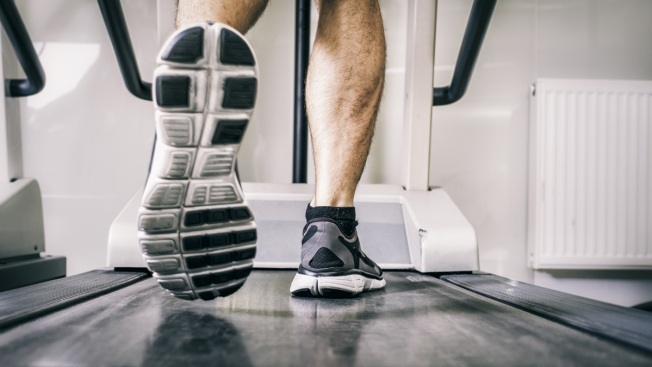 Major factors that contribute to treadmill injuries include whether the user is distracted, what they’re wearing and whether they understand how to properly use the equipment, said Dr. Laura Miele-Pascoe, an expert in sport and recreation and injury prevention. Still, Miele-Pascoe and other health and fitness experts stress that following easy steps can help exercisers stay safe while working out. Televisions, music players and phones are also big causes for injuries, Miele-Pascoe said. It’s important that a user sets up their music or television before beginning their workout. “Unfortunately a lot of people press start before they turn the monitor on,” she said. The results are usually bad shoulder injuries, facial and skin burns, and chipped, broken or lost teeth. Miele-Pascoe also advises users to consider their clothing before going for a run. Avoid loose garments and slip-on sneakers and check to make sure your shoes are tied. Lastly, Miele-Pascoe stressed the importance of following the manufacture’s recommendations. Facility operators should post signage that informs users of how equipment should be used and remain available in case users need assistance or find themselves in trouble. Both gym operators and private treadmill owners should also make sure children do not have unsupervised access to the powerful machines. The danger the equipment can pose to children made headlines in 2009, when the 4-year-old daughter of boxer Mike Tyson died of injuries sustained when she choked on a treadmill cord.